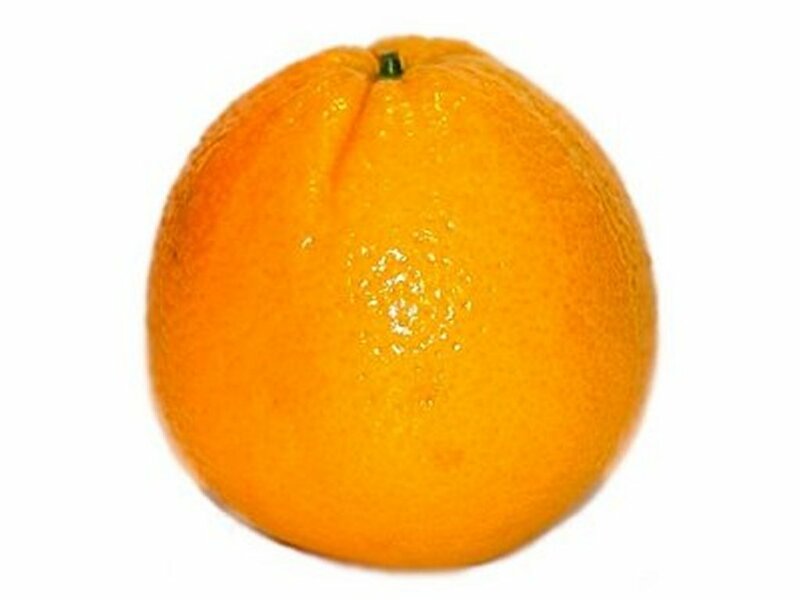 Time to think about the sunny happy sun drenched goodness of orange. 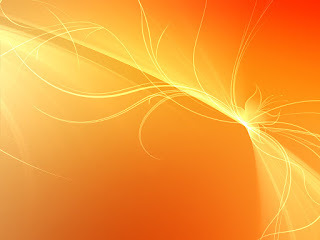 Have you noticed that we are focusing on brights so far? Not to worry, those pastels will all have their day. Just not this day. So dig into bright and bold orange and start sewing! 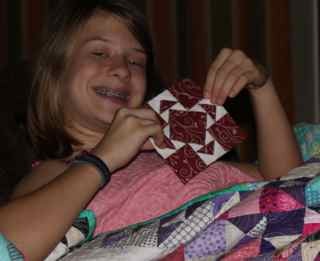 Tiny Tuesday this week brings another paper pieced block. It is A9 and came together in 5 sections. Ryan was happy to hold it for me. More applique today! 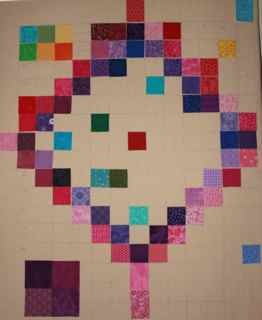 I wonder what I'll do when all the applique blocks are done? This one is G3 and was simple to do once I figure out how. 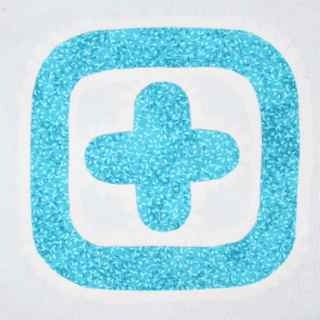 There are two white pieces, both were sewn to the top of a single teal square. Once again, easy enough to sew down after the preparation is finished. I was going to spend some time today on prep work for Dear Jane. While I was at it, a few super easy blocks found their way to being done. It would have been more, but Ryan's football team won their first game this morning and got to play another. We're all a little bit sunburned, but it was a fun morning. 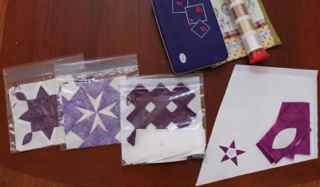 We are watching a movie as a family this evening, so I think I'll get that applique triangle on the left ready to go in case there is time for some handwork this week. 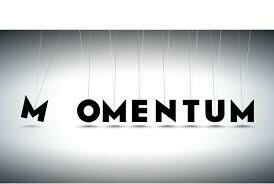 Having something ready to go is the key for me being able to get anything accomplished during the week. 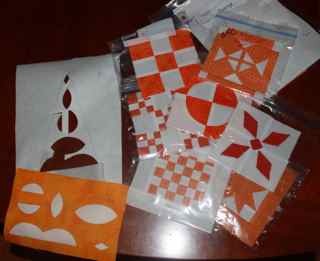 There didn't seem to be a lot of orange applique, but that could be because I crossed a lot of handwork off the list early on in this process. I started several things today, but didn't manage to finish anything. 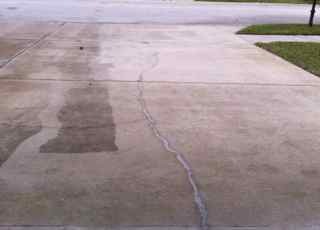 The power washer went kaput in the middle of the driveway. 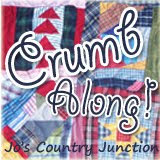 I thought that was a sign to settle into a little quilting. The first postage stamp block was almost done before it was time to go out for a girls night out. I've been caught up with work and kids lately so it was nice to have some girl talk. Tomorrow looks pretty calm. Ryan has a few football games I think, and I have some school work to get caught up on. It would be nice to take care of a few more purple scraps before the end of the month though. How have your purple plans gone this month? Still plugging along? Use the linky below to share your progress. Kurt made dinner tonight because it was his Friday off. He has a Green Egg now and does a lot of weekend cooking. 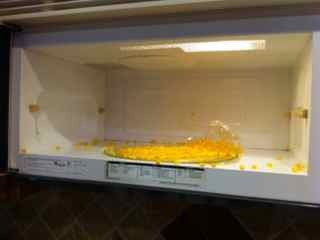 The corn was in the microwave though -- all over the microwave as the matter of fact. He's been gone this week so there has been no sewing time. I need to go take a look at what I can get ready for Scraphappy Saturday tomorrow. I think Sydney has Girl Scouts and Ryan has a couple of football games, but somewhere in there will be some quality fabric time I am sure. 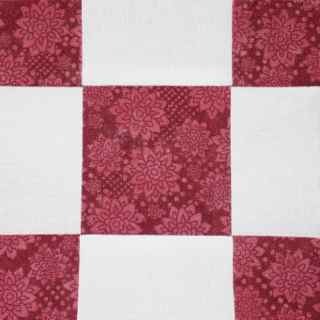 This is Dear Jane block A-5 which is called Cathy's Campfire. 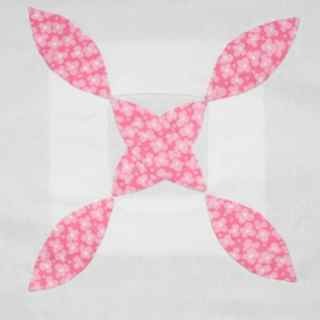 It was paper pieced in three simple sections. under a quilt. It is a good thing we have plenty to choose from. Yet another applique block this week. They do tend to get done in bunches when the prep work is done ahead of time. 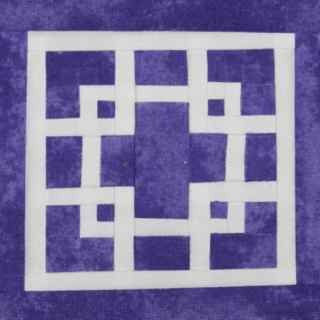 Another block with a combination of reverse and forward applique. This is I5. Just two days after returning from my overnight school field trip, we were all loaded up and ready to head out to Grandmothers house (over the river and through the woods). She started another round of chemo this week and the kids have Monday off of school. 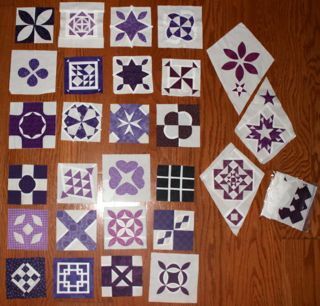 Lucky for me, there was still a bit of appliqué left on the last of the purple blocks to keep me busy on the drive up. There are still three baby quilts for binding to do on the trip back, so I won't be bored. Not that boredom is often a problem for me. February is a short month, so there is just one more purple Saturday after today. How are your purple projects coming along? 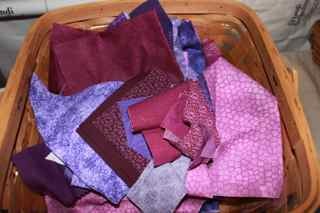 My purple basket is full again thanks to finishing ALL the purple Dear Jane blocks. Things are coming along well on the Dear Jane wall, now it is time to dig into the extras and turn them into lots of fun blocks. 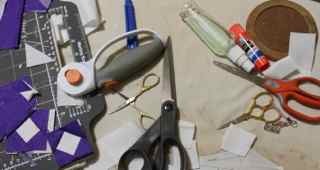 Use the linky below to share your own purple projects. I am with my AP Biology class at the University of Florida. 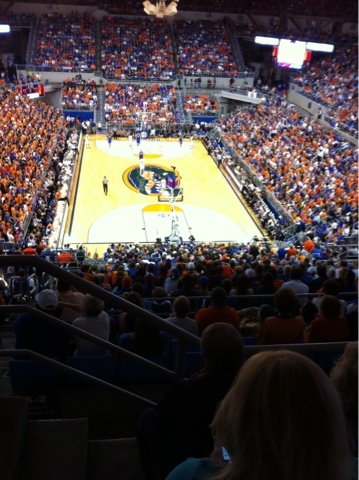 Last night we watched the gators best the blue devils at basketball and today we are off to do DNA electrophoresis. 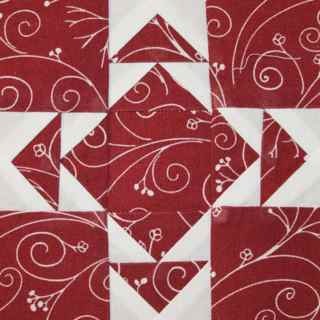 This was a super simple traditionally pieced block. It would have been even simpler if I hadn't accidentally used cream background fabric the first time instead of white. The light in the family room really isn't ideal for quilting. The drawing in the Dear Jane book didn't show a separate piece for the center section, but the picture did, and I thought it mad the block more geometric. 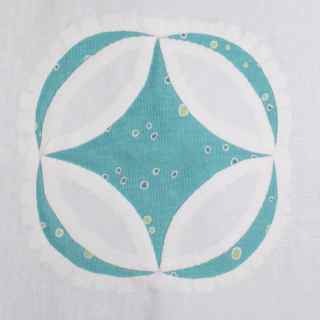 So first the three melon pieces were appliquéd to a small square before it was reverse appliquéd under a larger white square. The corner melons then got sewn of top of it all for the finished block. This one is Dear Jane J11. Here is the block I finally finished yesterday after letting it sit on the ironing board for a week. It is called Battle Field and is Dear Jane block D10. I think there are 42 pieces. One of the HST parts got rotated, but I had already put all the borders on before I realized. Still not sure if I will redo it. It is the last center purple block. These blocks have the machine part done but still need hand sewing. Just two more corner kites to go. They are all prepped and waiting, so today should be the day. Kites weren't nearly as scary as I though when I realized that they each started with a square block that had extra bits added to the edges. There is absolutely NOTHING scheduled all day today. Not a birthday party or a football game, no errands or obligation. Absolutely can't remember the last time there was a day WIDE open. I plan to enjoy every minute. 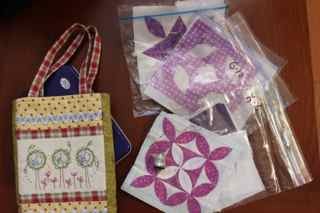 Head over to Kathy's blog to see what other slow stitching people have going on this Sunday of rest. 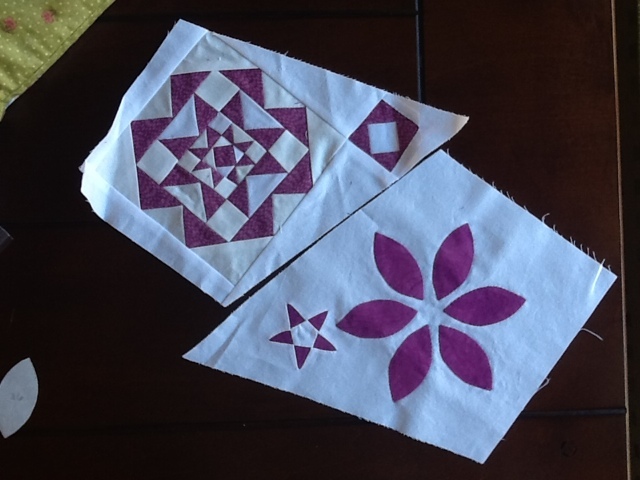 Another ScrapHappy Purple Saturday has rolled around and I am still working through purple Dear Jane Blocks. 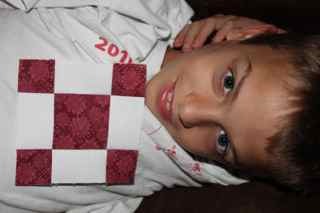 I finished three and two halves this week at gymnastics and piano lessons and during evening TV. Not much energy for actual sewing this week but I can still feel like I moved a little bit forward. 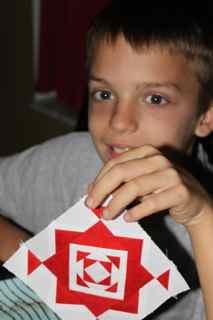 I was paper piecing another block last Sunday and it is still sitting on the ironing board just where I left it. Sydney has a Girl Scout field trip this morning and Ryan has a football game, but I think there is time for a bit of sewing after those are done. There is a birthday party this evening, which will take the girls away and Ryan is likely to be tired after having two friends sleepover last night. I am ready to tackle the corner kites -- wish me luck! What purple projects are under way in your neck of the woods? Use misterlinky below to let us know about your progress and plans. Applique AGAIN. This is D8 from the Rainbow Jane Collection. Eventually I will have to do some actual piecing, but for now, the applique is fun. 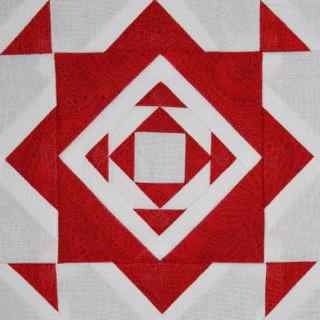 This block was a combination of regular and reverse appliqué. 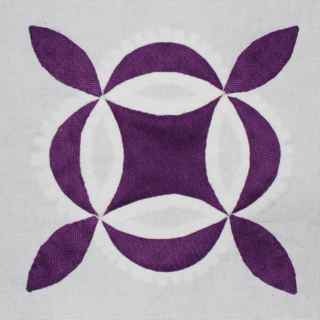 The outer white ring was sewn on top of a purple block before the melons were applied inside the purple ring. Then the purple melons were sewn on top of the whole bunch. It has a pretty shape with all the curves I think. Yesterday was full of driving back and forth to the mall for science fair. I had my handy little bag of handwork available for down time and managed to sew a melon or two on Cheiko's Calla Lilly which is Dear Jane J-10. The last time is sewed this block, all the points got cut off when I sewed them together, so this time I marked the seam allowance with a blue water soluble pen. Do you see the little handmade bag? It was a gift from my blog friend Amanda and it makes me smile whenever I use it. She has broken her arm recently falling on ice, so I am sure some love and warm wishes from us all would be most welcome. 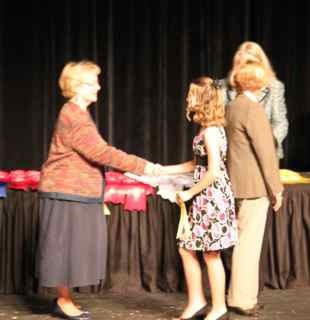 So here is Anna getting her 4th place ribbon for her science fair project. She was a little bit disappointed, but has already started to plan improvements for next year. I try not to be one of THOSE parents when it comes to science fair, but I did try to offer some encouraging advice. Our school did quite well with prizes and four of the top winners were my students, three from AP Biology and one from my Honors Biology class. They are all invited to the state science fair as well as international which I think is in Phoenix this year. The Super Bowl is tonight, and though I do have to keep asking to be reminded who the two teams are, we will still watch as a family. One of our neighbors has a party each year so we will probably visit with them for a while as well. Maybe I will get some more handwork done during the game, as the commercials are the fun part for me. 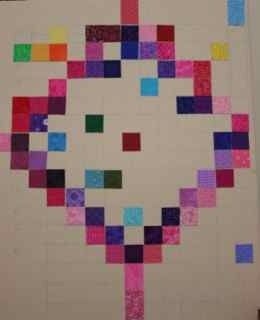 February is going to be a purple month for the Rainbow Scrap Challenge. 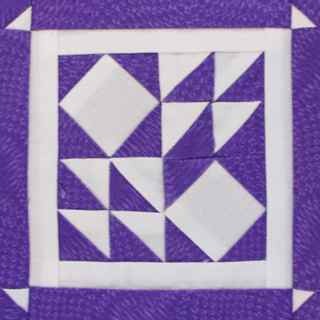 I've been working diligently at purple blocks already My strategy is to finish off the purple Dear Jane blocks early in the month and then use the rest of my time to sew the extras from those blocks into my other RSC13 projects. This one is called Maze of Madness. Good name I think, for a block with lots of little bitty bits. Use the linky below to share and purple progress or plans. I wasn't going to do much sewing tonight. I was all settled in with a bit of applique when Ryan came and took over the TV for a video game. Instead I went back to the sewing room to get just a little bit done. It is SO easy to just pull out a baggie when they are all ready to go. 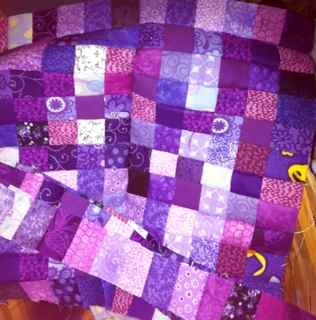 All the purple blocks from the bottom half of the quilt are done. It looks like just 4 more blocks will do it. Then I'll have to figure the corners out. Happy weekend everyone.